I often find myself inspired by the fun, creative ideas posted over at OhDeeDo. It’s a great conglomgerate of clever minds and resources. 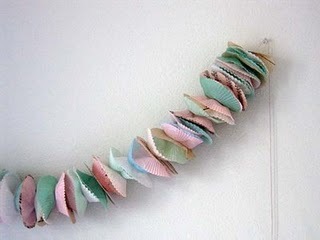 One of their latest posts: cupcake liner garland. They show it displayed in a bedroom, but I’m thinking it’s perfectly suited for birthday parties or baby/bridal showers. And can’t you just visualize it with Valentine-y cupcake papers? So simple, but also a bit charming. Oh that’s such a great idea! Perfect for parties, or just for a little something to spice up a dreary winter. I did this last Valentines with red, white, pink, and hearts liners in my window. It was quite cute and people were a little amazed at how cute something so simple could be. Fun! oh how sweet is that! VERY cute! !